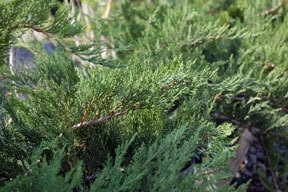 The tam juniper is one of the most commonly planted junipers in the Southwest. Deep-rooted and drought tolerant, it makes an ideal ground cover shrub or foundation planting for full sun. At full maturity they are approximately 4 feet high by 6 feet wide. Their compact, layered branches are covered with attractive, dense, dark green foliage. Tiny cones and silvery blue berries appear in summer. Tam junipers are very hardy, suited to USDA Zones 3-10.